How To Tell If A Tick Bite Is Infected? Local infection rates-tick bite Lyme disease-how likely are you likely to be a victim? 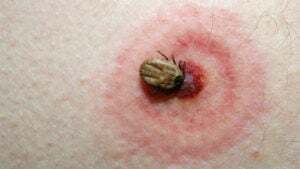 What is tick bite bulls-eye rash? What to do for tick bite rash? Here are some pictures of tick bite in humans. Some people develop a reddish rash which resembles a bull’s eye or target like pattern. The chance of getting infected by tick bites increase if there is a significant risk of infection in your community. However, one can never know the statistics pertaining to Lyme disease. Many times, Lyme disease is misdiagnosed as it produces symptoms very similar to other health issues. 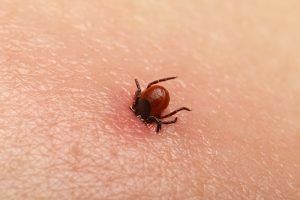 Some local health departments across the United States are much more stringent in gathering data pertaining to tick bite infections. They are also fastidious about bagging and studying the tick specimens that are causing these infections. The best way to know if a tick bite is likely to be infected is talk to neighbors about anecdotal reports of tick bite infections and also media coverage about it. If needed, call the local health department and ask them careful questions if they try to assure you there is no infection. The number of times an infected tick bites you as well as the average feeding will determine the risk of infection as well. So, the more you are bitten, the greater are your chances of infection. Also, even a single bite can cause problems, so you can never say for sure that “Oh, I have been bitten only once by a single tick, so I am safe”. This is not the case. While not all deer tick or Lone star or blacklegged ticks can carry the infection, the rate of Lyme disease is on the rise in both Canada and the United States. People with weaker immune systems are also a lot more likely to develop tick bite infectious diseases. It is very important to remove the tick completely from the body. You should grasp it with the help of tweezers and pull it out vertically upwards to prevent leaving behind any of its parts. Immediately wash the bitten area of the skin with antibacterial soap. If the mouthparts do remain in the skin, let them be. Allow the skin to heal over the next few days. Ideally you should bag the tick and note the date on which you were bitten. In the weeks following the bite, watch out for symptoms of Lyme disease. If you develop a fever, bullseye rash, arthritis, or other signs; seek immediate medical help. Take the bagged sample of the tick along to your appointment as it can help your doctor in their assessment of the disease. 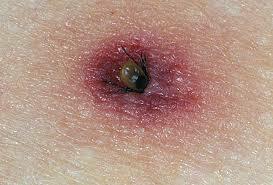 Diagnosing Lyme disease in its early stages can significantly reduce the chances of long term health problems. Seek medical help if you have above symptoms. Your doctor might ask you questions pertaining to your recent activities which may have brought you in contact with ticks. Based on the symptoms and other details, your doctor might prescribe you antibiotics. Take them as directed and do not miss a dose just because you feel better. Doing so could cause the infection to return, or even worsen. You need to take the antibiotics for 2-4 weeks or longer depending on your symptoms.